Our goal at Chem-Dry of Northern Nevada is to make your home a happier, healthier place. Here are some important home cleaning tips! Wipe down countertops regularly. Countertops serve more purpose than just preparing food. And dirt, dust, and bacteria are prone to settle there. If your countertops are granite or tile, use a mild cleaner. Preferably one that can refresh the sealer. Sealers can wear down over time and it’s vital to keep the sealer fresh to prevent bacteria and further damage. Maintain clean carpets and rugs. Vacuum your rugs and carpet weekly with a bag vacuum. Weekly vacuuming will keep your home cleaner and improve the look of your carpet. Look for a vacuum cleaner that has a HEPA filter or microfiltration system. It’s important to remember that for a thorough clean, call a professional carpet cleaning company. 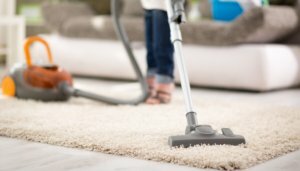 Vacuuming will pick up dirt from the surface, but plenty remains at the base of your carpet that vacuuming cannot reach. A professional cleaning also decreases the possibility of allergy symptoms. The EPA recommends getting carpets professionally cleaned at least once a year, and in homes with pets and/or children. Don’t forget about your upholstery. Furniture is forgotten about much too often. People spend a significant amount of time on their couches and chairs, yet rarely clean them. Just like carpet, particles like dust, dirt, and allergens tend to settle on upholstered furniture. Vacuuming furniture is easy and just as important as carpets. Sanitize high touch points around the house. This includes doorknobs, toilet handles, faucets, and light switches. Spend some time sanitizing these areas especially before and after guests come into your home. Take an extra step and be vigilant about washing your hands throughout the day. Use doormats and area rugs in entryways and high-traffic areas. These do a great job of trapping dirt before it can enter your home. This is an effective and inexpensive way of preventing unwanted and unhealthy particles from moving deeper into your home and circulating throughout your home. Check and replace your heating and air conditioning filters. While furnaces are vital to keeping homes warm in the colder months, it’s important to change the furnace air filter at regular intervals to prevent dirt, dust and other unhealthy particles from being distributed around the house. To remind yourself when it’s time to change the filter, write the date that you’re performing the replacement on the outer edge of the new filter that you’re installing to make it easy to know when your next one is due. Next time you need your carpets or upholstery professionally cleaned, call Chem-Dry of Northern Nevada or request an appointment online!